Classic Achieva was picked for our 3rd Annual Blaze's Ride to the Rescue Trainer Challenge. She was chosen by Trainer Rebekah Schultz. Rebekah will be working with Classic Achieva for the next 100 days, turning Classic Achieva into a dependable riding companion. Rebekah will be going against 11 Trainers in our Trainer's Challenge. We also have 7 Youth Trainers competing in our Trainer's Challenge. Competition is set for April 26, 2014 at the Lazy E Arena, Guthrie, Oklahoma. Classic Achieva will be available for adoption immediately following the competition on April 26th, 2014. Classic Achieva is a sweet girl and loves attention. Classic Achieva has a current negative coggins, up to date on vaccinations, deworming, teeth floating and hoof maintenance. Classic Achieva has also been freeze branded and micro chipped for her protection. If you are interested in adopting Classic Achieva, please submit an adoption application and get your pre-approved status, in order to adopt Classic Achieva or one of our other Rescued Horses competing on April 26th. Adoption Fee's start at $800.00 each. 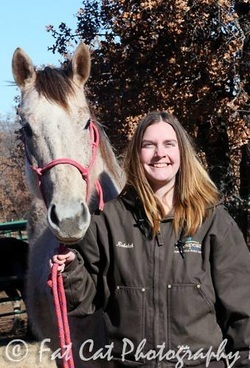 If more than one pre-approved adopter is interested in the same horse, the horse will be placed into auction to the highest pre-approved bidder. to work on ground driving her to help her understand what I am asking. She picked up on it quickly and was able to relax and listen. I've worked on saddling her every single day that the weather permits because she is still nervous about being saddled. I am very happy with her progress. She has come a long way since we have been working together and I am excited to see where her and I will go together.